A peaceful march by Central American migrants waiting at the southwestern United States border veered out of control on Sunday afternoon, as hundreds of people tried to evade a Mexican police blockade and run toward a giant border crossing that leads into San Diego. In response, the United States Customs and Border Protection agency shut down the border crossing in both directions and fired tear gas to push back migrants from the border fence. The border was reopened later Sunday evening. The episode comes at a time of growing tension on both sides of the border and promised to become the newest flash point in the story of a caravan that was the target of President Trump’s anti-immigrant rallying cry during the midterm elections. Mr. Trump has made preventing caravan members from entering into the United States a signature stance of his administration over the past few weeks and has sent American soldiers to the border, although the United States military was not involved in Sunday’s clash. The images of unrest Sunday will likely provide him with additional ammunition as he tries to keep out the caravan members and other immigrants and refugees fleeing poverty and violence in their homelands. The standoff at the border threatens to become the first crisis for Mexico’s president-elect, Andrés Manuel López Obrador, who takes office on Saturday. His government will be forced to navigate demands from Washington to deal with the migrants — at the same time that it faces deepening concern from Mexican border communities straining to house and feed thousands of impoverished and increasingly desperate guests. 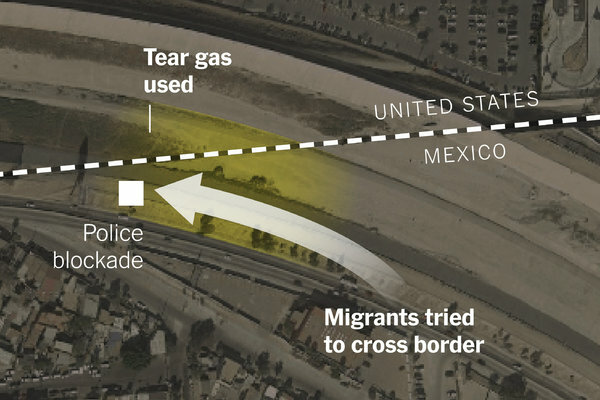 Law enforcement used tear gas against migrants in at least two of the locations. Soon after the migrants began their midmorning march to the border in Tijuana, they were met by Mexican federal police officers at a bridge that leads to the San Ysidro border crossing, through which millions of people and vehicles pass each year. At that point, many of the marchers bypassed the police by running across a dry riverbed. The police, carrying riot shields, formed a new line and appeared to contain the rush of migrants 100 yards or more from the crossing. They erected metal barriers on the roads and sidewalks leading to the main border crossing for cars and trucks. A smaller group of migrants then tried to make their way to a train border crossing a few hundred yards away, where they were stopped by tear gas fired by United States Customs and Border Protection officers. After the gas cleared, Mexican federal police officers pushed the protesters back from the area of the train crossing. Customs and Border Protection officers also used tear gas at a separate point a few hundred yards away from the train crossing to drive back the migrants. Some of the migrants told The New York Times they thought they could negotiate with United States officials to be allowed to pass. A few men tried to climb the wall but fell back in the face of the gas. At least two dozen tear gas canisters could be seen on the Mexican side of the border after the migrants eventually turned back. @John Get a grip. We’re a sovereign country with defined borders and immigration laws. We cannot afford to provide all the necessities of life to millions upon millions of poor foreign nationals (and their progeny) who brazenly, and with an attitude of entitlement, exploit our system of public services intended for our own citizenry. Tear gas across the border against unarmed families is a new low. Kirstjen Nielsen, the Homeland Security secretary, said in a statement that some migrants who were trying to breach the fence had thrown projectiles at Customs and Border protection workers.